On August 24, Beijing hosted a meeting of the Chairman of the Board of the Eurasian Economic Commission Tigran Sargsyan with the first Vice Premier of the State Council of the People's Republic of China Zhang Gaoli. The visit took place at the invitation of the Chinese party. In turn, Zhang Gaoli said that now the world was experiencing profound changes, and the world economy was recovering very slowly. "In these circumstances, the Chinese leadership attaches great importance to cooperation with the EAEU. China builds good relationships with all the member states of the EAEU," he stressed. Tigran Sargsyan agreed that the changes in the world occurred very quickly, a new architecture of global trade was being formed that China and the EAEU had to actively promote cooperation not to be outside of the global trends. China is one of the key economic partners of the countries of the Eurasian Economic Union. Currently, work is under way on forming a broad economic partnership on the basis of the EAEA and the Chinese initiative of the Silk Road Economic Belt (SREB). "I know that you oversee the Chinese initiatives and the project for development of a new Silk Road, conjunction with which is one of the priorities in the development strategy of the Eurasian Economic Union,” the EEC Board Chairman said. Tigran Sargsyan stressed that the EAEU shared the approach of China in respect of formation of an open economic architecture without a political component, oriented on business and reducing barriers. Zhang Gaoli said that the nature of modern trading blocs often considered the primacy of regulations, rules of a single country. "But the world is changing, and conjunction of the EAEU and the SREB is a process aimed at integrating the interests of all the conjunction parties," the First Vice Prime Minister of the People's Republic of China stressed. The EEC Board Chairman expressed the conviction that the focus on the conjunction of the two projects was a testament to the desire of the Union countries to create a harmonious space for mutually beneficial cooperation. At the suggestion of Zhang Gaoli, the parties agreed on establishment of a data bank on the joint projects of China with the Member States of the EAEU. The Chinese party noted the important role of the Eurasian Economic Commission in promoting the projects of mutual interests. The Chinese party, according to Zhang Gaoli, if necessary, will apply to the EEC for support during the implementation of mutually beneficial projects, and this is a good basis for institutional cooperation. 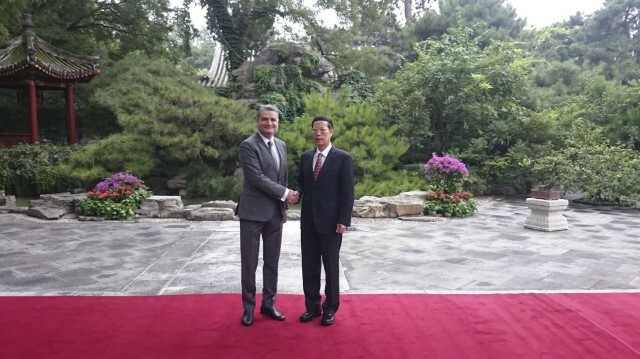 Tigran Sargsyan and Zhang Gaoli agreed that they would meet periodically to discuss the development of relations and support the responsible authorities in finding optimal solutions.